Monday through Thursday, 6:00 p.m. to 10:00 p.m.
Friday through Sunday, 6:00 p.m. to 11:00 p.m.
New! Fir de Lis: We celebrate the holidays in a big way at City Park-- and this year's new must see exhibit fits right in. At 50 feet tall, the Fir de Lis is Louisiana's largest decorated live Christmas tree. The la Maison Noel features a traditional-style home decked out for the season. Inside, Père Noël sits next to a fire while he checks his list and overlooks a réveillon feast. New Orleans tradition continues as the two-story tall Mr. Bingle that reigned over generations of Christmas seasons on Canal Street now watches over Celebration in the Oaks. For more information about the history and magic of Mr. Bingle, visit mrbinglefans.com. Also visit Dillard's Mr. Bingle homepage for information about Mr. Bingle merchandise and store locations. 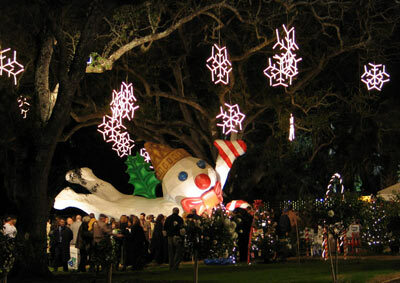 Mr. Bingle is a registered trademark of Dillard's, Inc.
A state of the art twenty minute Laser Light Show with various holiday themed animations and music will be presented nightly in the Azalea and Camellia Garden of the Botanical Garden. The new show was created especially for the 2006 edition of Celebration in the Oaks. The multi-media Cajun Night Before Christmas exhibit depicting the classic local twist on the traditional tale featuring life-size lighted figures as illustrated by James Rice synchronized to Cajun narration is presented nightly. More than 25 years after its first publishing, Cajun Night Before Christmas has become a modern classic that has sold more than 490,000 copies. A delightful twist on the classic poem by Clement C. Moore, A Visit from St. Nick (or more popularly 'Twas the Night Before Christmas), the James Rice illustrated tale is set on a Louisiana bayou, Santa’s dressed in muskrat “from his head to his toe,” his skiff is filled high with toys and is hitched to eight friendly alligators, not a Prancer or Comet among them. Pelican Publishing of New Orleans agreed to allow the park to recreate the tale in memory of Rice who died in June of 2004. A twenty-foot tall Poinsettia Christmas Tree is the focal point of the Botanical Garden's Conservatory of the Two Sisters. The conservatory also features the Tropical Rain Forest and Living Fossils exhibits. Gallery of Childrens' Trees: Children from area schools will create handcrafted ornaments and proudly display them on Christmas trees lining the walkways in the Botanical Garden's PLANO Garden. Garden Club Wreaths: The Federated Council of New Orleans Garden Clubs and the Jefferson Parish Council of Garden Clubs will display holiday wreaths in the Lath House and Carousel. Several other large lighted exhibits will be located in the Botanical Garden. Amusement Rides: The Park's Carousel Gardens with rides including the century-old Antique Carousel*, Miniature Train, Live Oak Ladybug Roller Coaster, Fun Slide, and new rides such as Bumper Cars, Rockin' Tug, the Scrambler, and Tilt-A-Whirl. * Kid's rides include the Mini-Jet, Umbrella Cars, and Construction Zone. Ride bands for unlimited rides are available for $12/person/night. Individual Ride tickets are also available for limited rides ($2-$3 per ride). *Antique Carousel and Tilt-A-Whirl are scheduled to be operational in time for event. One or more of these listed rides may not be operational at some time during the event due to weather or unforeseen circumstances. Entertainment: Each evening, groups will perform. Groups include gospel groups, children's choirs, dancing troupes and many of New Orleans most talented performers. Living Nativity: Re-enactments of the Nativity will be presented by area public and parochial schools with the help of the Council of Catholic Schools Cooperative Club and the Archdiocesan Office of Catholic Schools in the Botanical Garden. To participate, contact Cheryl Cabes at (504)887-5627 or busylady1@cox.net. Family Holiday Photos and Santa Photos: Professional Photographers will be on the walking tour offering photos for purchase at the event (cash or credit card only). Visits with Santa Claus: Located on the walking tour nightly from November 23rd through December 30th, 2007, 6:00-10:00 p.m. The New Orleans Botanical Garden, replanted and generously decorated for the season. Storyland: City Park's fairy tale theme park featuring twenty-six larger then life storybook exhibits for kids that allow our little visitors to climb on, slide down or pretend to be their favorite character. Mother Goose, Pinocchio's whale, and Captain Hook's ship as well as many other whimsical figures will delight the young and young at heart nightly on the walking tour. 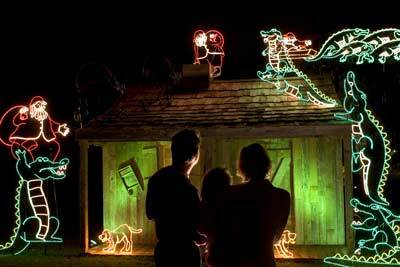 City Park's annual holiday lighting exhibit and celebration returnswith old favorites and new attractions. The display will be open weekends only November 23rd through November 25th and November 30th through December 2nd, open nightly December 7th through December 30th, closed December 24th and 25th. Hours are 6:00 p.m. to 10:00 p.m. daily, . A registration fee is charged. Participants are entitled to free early walking tour admission (Garden, Amusements, and Storyland), a commemorative glow-in-the-dark T-shirt, and refreshments. Registration begins at 2:00 p.m., the race at 4:00 p.m. Sponsored by the former owners and employees of Radiofone. Visit the City Park Calendar for a listing of all City Park events. Please visit the Celebration in the Oaks™ home page for updates on the Park including a listing of City Park attractions that have reopened and their hours of operation. 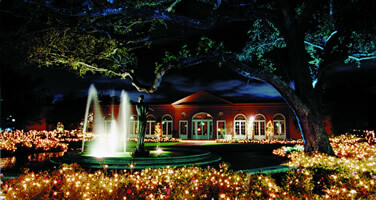 Celebration in the Oaks™ is the site of many of New Orleans' best holiday parties. The Celebration in the Oaks Preview Party and the Children's Preview Party the weekend before Thanksgiving are among the New Orleans area's top annual public events, providing a large array of food and beverage and top entertainent. In addition, many companies and organizations host their annual private Christmas and holiday parties on the grounds of the Botanical Garden at one of our rental facilities within the most festive setting imaginable. A centerpiece of the 12-acre New Orleans Botanical Garden, the Pavilion of the Two Sisters is modeled after a traditional European orangery. With its long banks of arched windows, the Pavilion offers lovely vistas of the Zemurray Azalea and Camellia Garden featuring the Fluteplayer fountain by artist Enrique Alferez to the east and the original 1930s garden and new Conservatory to the west. With cool slate floors below and a Mario Villa designed palm frond chandelier above, the Pavilion measures 100 feet long and 60 feet wide. The climate controlled main room is 87 feet long and 60 feet wide and is capable of comfortably accommodating 200 to 400 guests for a cocktail reception, a seated dinner for 300 or theater-style. For more information, visit the City Park Facilities page, contact City Park Sales at (504)488-2896, or email cpsales@nocp.org. The Garden Study Center is an extraordinary example of WPA architecture. This beautifully restored structure is one of the original brick buildings in City Park designed by the late architect, Richard Koch. Near the lily pond and the Conservatory, it has solid brick walls, a slate roof and copper gutters reminiscent of an old English cottage. This fine facility comprises 1,620 square feet and is ideal for meetings and small parties, and is equipped with complete audio-visual facilities. The building also includes a smaller meeting room, warming kitchen and restroom. The Garden Study Center accommodates 100 guests for auditorium-style seating, 60 guests for seated dinners and luncheons, and 50 to 75 guests for cocktail parties. The Lath House is located next to the Garden Study Center. The restoration of this Lath House won the prestigious Founder's Fund Award from The Garden Club of America in 1997. The Lath House occupies approximately 2,400 square feet and the main room is 30' x 42'. It has a translucent bronze-tone roof, open lath sides, and a stained and scored concrete floor. Combined with the Garden Study Center, the Lath House provides tremendous flexibility and opportunity for your special event at the Botanical Garden. The Lath House in conjunction with the Garden Study Center accommodates approximately 175 guests for a cocktail party. There is truly no better or magical venue for your next Christmas Party than Celebration in the Oaks. Private Party Guests receive admission to the Celebration in the Oaks walking tour. Celebration in the Oaks™, City Park’s annual holiday celebration, offers volunteer opportunities for groups and individuals and sponsorship opportunities ranging from $500 to $75,000. This event runs from late November to early January and attracts more than 500,000 visitors to the park each year. For more information about opportunities and recognition, email us. As you may know, City Park receives no operating funds from the city and virtually none from the state, so it is only with the outpouring of support such as yours that we can provide the New Orleans community and its visitors with this spectacular event. Celebration in the Oaks™ invites you to join the various groups who, through their volunteer support, have made City Park’s annual lighting exhibit one of the most spectacular and popular displays in the country. Involvement in Celebration in the Oaks™ would provide your group with an association with a large community event attracting over 500,000 people to City Park. City Park receives no state or city funding for operating expenses and is totally dependent on self-supporting activities such as Celebration in the Oaks™ and community support. Please assist us and demonstrate your commitment to City Park’s 1300 acres of green space, providing recreational opportunities to over a million visitors annually. If you are interested in volunteering, please e-mail us. Celebration in the Oaks™ Needs You! Celebration in the Oaks™ was created in 1984 to generate revenue at a slow time of the year for City Park. Revenue, visitation and community participation have increased annually allowing City Park to benefit financially and gain valuable exposure for City Park’s 1300 acres of green space which provides quality recreation to over a million visitors annually. WWL-TV and Superior Energy Services are our major sponsors providing invaluable support and financial assistance. As the event has grown we have reached out to the community to grow with us. Please email us to participate. We recognize that you are asked to give to many worthy causes each year and we appreciate and value your consideration.